When you are planning a backpacking adventure, you need to make sure you have all the proper gear. The biggest item you will need to bring along is a tent. Choosing a good tent is crucial to having an enjoyable backpacking experience. It will be your home away from home, so it needs to provide proper protection and comfort. Of course, there are tons of options out there and it can soon become overwhelming when trying to decide which one to buy. To make it easier for you, we have put together important features to look for when searching for a good backpacking tent. We have also put together a list of the top 10 best backpacking tents based on user reviews. This Sundome tent is a popular choice because it offers good quality at a budget friendly price. With two large windows, you will get good ventilation and you will also be able to enjoy the views of your location. The mesh vents in the roof allow for more airflow. The roof is mesh which reduces condensation inside the tent. The welded 1000D polyethylene bathtub style floor prevents water leakage. The hooded rainfly provides more weather protection to guarantee that you stay dry. The fabric of the fly is made of durable coated polyester and it won't sag when wet. This tent has continuous pole sleeves, a pin and ring design, as well as pole clips for easy setup. You can store your small items in the interior storage pocket. Weighing just a little over 4 pounds, this tent is lightweight and won’t be a burden to take along for your backpacking adventure. It offers more than 35-square feet of floor space, plenty of room for 2 people to sleep comfortably. Featuring a bathtub style floor with taped seams and coated polyester rainfly, the interior of this tent is sure to stay dry. 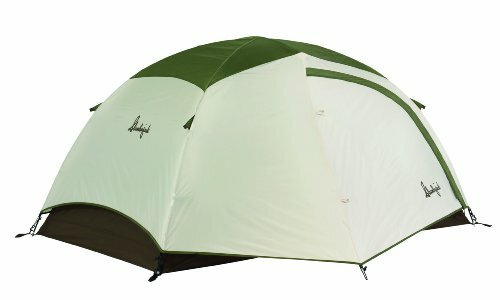 The adjustable windows in the rainfly and mesh wall panels allow you to get proper ventilation inside the tent. The aluminum alloy poles make the tent sturdy against winds. This freestanding tent has a 2 pole design, making it easy to get set up. For your convenience, the setup instructions are printed right on the sack. 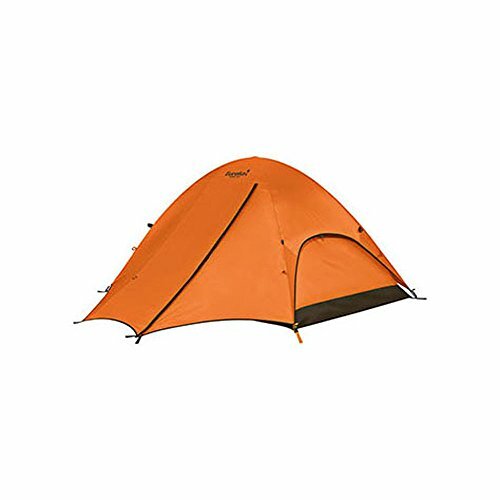 This freestanding, super lightweight tent is a great 1 person backpacking tent. The pole clip design makes it easy to set up by yourself. The walls are half mesh to provide excellent ventilation. The seams in the bathtub style coated polyester floor are sealed to prevent water leakage. When you need extra weather protection, you can buckle on the polyester rainfly so that you don’t get wet in the rain. The seams in the rainfly are sealed for maximum water-resistance. When you need to make the tent more stable in windy conditions, you simply attach the guy lines. There is one vestibule you can use to stash your small items. The zippers on the door and vestibule are durable, extra large #8 zippers. The bathtub style polyester floor with sealed seams and the double-coated StormShield polyester fly provide superior protection from the elements. One wall of this tent is made entirely of no-see-um mesh which allows you to star gaze at nighttime and also provides excellent ventilation. There is also a vent to allow for extra airflow. It also has 2 windows and 2 doors. 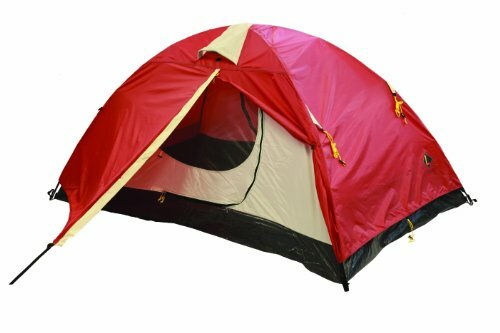 This free-standing, two-pole tent has a shock corded fiberglass frame. The color-coded webbing, ring and pin attachments, and pole sleeve attachments make it easy to set up. The external guy points can be used to attach guy lines to secure the rainfly when it is windy. Store your things using the 2 mesh gear pockets. With sealed seams in both the welded polyethylene floor and the rainfly, this tent is sure to keep you dry. The rainfly is also UV-resistant and will stay taut when wet. For ventilation, there are 2 windows, roof vents, and a mesh roof to allow for airflow and reduce condensation. You can use the gear loft and interior storage pocket to store some of your things. If you want to hook up any electrical appliance, there is an E-port you can use to run the electrical cords. The shock corded fiberglass frame uses multi-diameter poles to create a strong structure and provides more interior space. 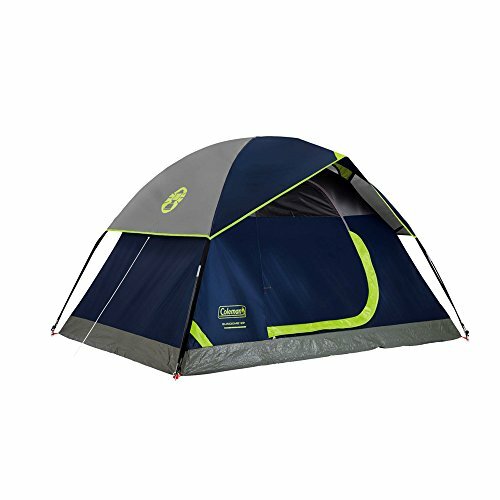 With high-strength aluminum poles, this tent can withstand high pressure from the wind. The nylon fabric is durable with a waterproof index of over 4000 mm. The door has a two-way zipper so that it can be opened from the inside or outside. This compact dome tent can fit up to 4 people. The shock corded fiberglass frame has a pin and ring system for easy setup. The attached mud mat helps keep the tent clean. You can use the gear loft and utility pocket to store your things. The Stow ‘n’ Go feature makes it easy to setup, take down, and store. 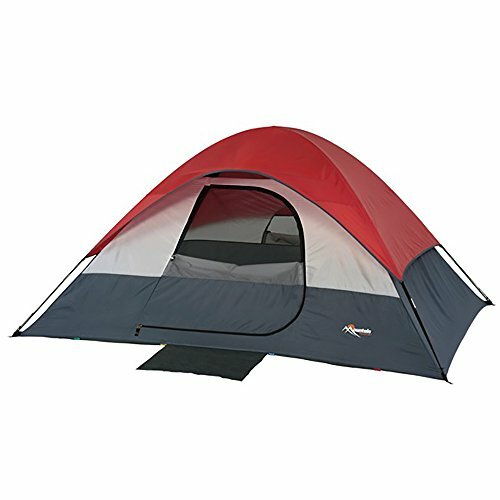 Featuring a ridge pole design, this tent offers maximum interior space. The color-coded clip design allows for a quick and easy setup process. The rainfly has a side-release buckle for easy connection to the tent. Taped seams ensure that you stay dry. 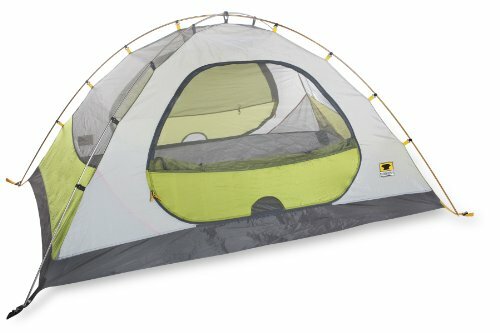 This dome tent has 2 windows for ventilation and 2 doors for easy entry and exit. The shock corded fiberglass frame attaches to the tent with all clips. The rainfly forms an awning over each window so that you can have the windows open when it's raining without getting wet. The taped seams in the rainfly and bathtub floor make this tent totally weatherproof. There are 2 interior pockets and a gear loft where you can store your small items, keeping the tent organized. Before purchasing a backpacking tent, there are a few things you need to consider first. This will depend on how many people there will be backpacking with as well as your own personal preference. Keep in mind that the capacity for a tent is based on how many people can fit in the tent, with no extra room for luggage. Of course, if you are backpacking, you will most likely want to carry a light of a load as possible, which means the smallest tent that will fit your needs. However, make sure there will be extra space for your things if your luggage will be inside with you. For example, if you will be camping by yourself you might automatically start searching for a 1 person tent. Keep in mind, though, that if you need to store your luggage inside your tent, there will not be enough space left for you to lie down. Think of upsizing the tent capacity by 1 or 2 people to make sure there will enough room for luggage. As mentioned previously, this is usually of utmost importance to backpackers. A few extra ounces here and there might not sound like a lot, but when you are carrying a tent for long periods of time, it can make a big difference. Think about how much you can personally carry. If you will be backpacking with others, you could all carry different pieces of the tent to make the load lighter for everyone. 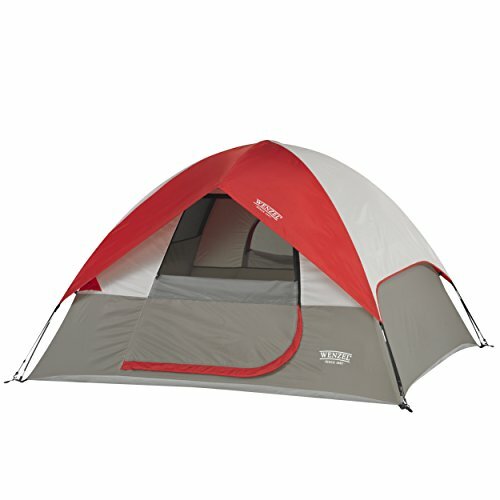 Try to get the lightest tent without having to sacrifice durability. Since you will likely be spending a lot of time inside your tent on your backpacking trip, make sure it will be comfortable. Losing a night’s sleep because of an uncomfortable tent can ruin your trip. Be sure that the tent has enough room for you to lie down, stretch, and sit up. If you are tall, you should pay even closer attention to this. If you will backpacking with 1 other person or more, it’s convenient to have two vestibules and two doors. Having two vestibules will ensure you each have a space to put your things. 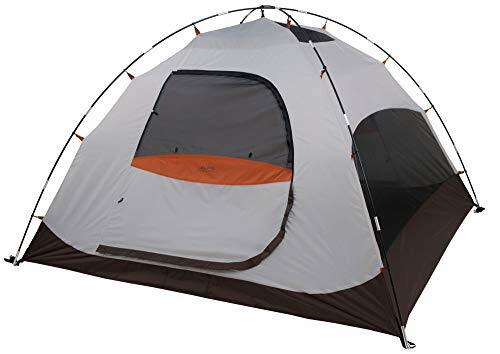 Having two doors is nice because you won’t have to climb over your partner(s) to enter and exit the tent. How much you want to spend can largely depend on how often you will go backpacking. If it’s more of a one-time thing, consider some cheaper options. If you will be backpacking a lot, it is good to spend a little more to get a tent that will last you many years. That being said, you don’t necessarily have to buy the most expensive tent to get a good quality one. If you take care of your tent properly, even a more inexpensive tent should last you a long time. Three season tents are the most popular choice for tent buyers. They offer protection from the rain and wind while at the same time provide adequate ventilation. They are made to use in the spring, summer, and fall. 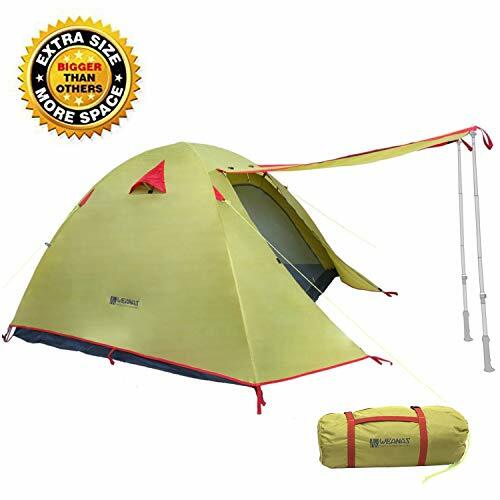 Three season tents cannot withstand harsh weather such as heavy snow. One and two season tents are for summer use, but offer little to no protection from rain. Four season tents are supposedly good for all seasons but are really only good if you will be camping in the winter. They are very durable and have thick fabric and durable poles to withstand heavy rain and snow. Since they are built to keep you warm in freezing temperatures, they offer little ventilation. This makes them impractical for summer use. After a long day of hiking, you will probably not feel like spending a lot of time setting up your tent. 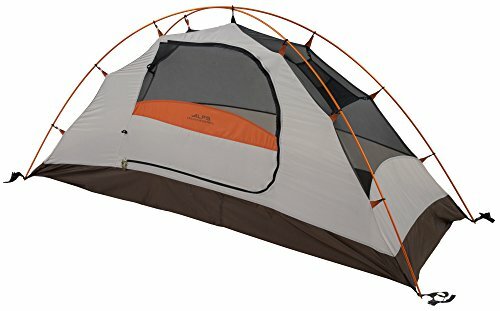 Pay attention to the tent design to make sure it is simple and easy to set up. Freestanding tents are easier to set up. Features like pole clips and continuous pole sleeves speed up the setup process. Make sure you buy a tent that will protect you from the elements. A tent that fails to provide proper protection is not only inconvenient but dangerous. A good tent should be designed to be weatherproof. Look for a tent with a durable rainfly with taped seams. A bathtub style floor prevents leakage through the seams at ground level. When shopping for a tent, you will probably see these terms in the descriptions. It is important to understand them so that you can choose the best tent for you. Single- wall tents have just one layer of waterproofed fabric. Some backpackers prefer single-wall tents since they are lightweight. They are also easy to set up and move around. If getting a tent that is lightweight is of utmost importance to you, a single-wall tent may be the right option for you. The downside of single-wall tents is that since they are not breathable, condensation easily forms inside the tent. Because of this, they are best to use in dry environments. Double-wall tents have two layers of fabric. The inner layer is made of a breathable fabric. Many are made mostly of mesh. The outer layer is called the rainfly and it is waterproof. There are usually vents in the rainfly to allow for ventilation so that condensation does not form inside the tent. You and your gear will stay dry. The disadvantage double-wall tents have is that because of the extra layer of fabric, they are heavier and take longer to set up than single-wall tents. However, most people still prefer double-wall tents. Choosing a tent to use for backpacking is not hard once you know what to look for. Remember that single-wall tents are lighter but often have problems with condensation forming on the interior. Double-wall tents do not have this problem but are heavier. Decide which features are most important to you. Of course, there are other things that any good backpacking tent should have. Keep those key features in mind before making your purchase. When you finally get a good tent, your backpacking adventure is sure to be a success- at least as far as the tent is concerned.